[/caption] Over the years I have tried to find the best spot to take a photo of the Three Sisters and Mt. Bachelor in winter. However, I have never been able to get both of them in the same photo. I eventually found one of the best spots to attain these photos with little more than a 2 hour snow-shoe adventure that ends at the summit of Bates Butte. The butte is just a few miles southwest of Sunriver. The butte is right off the road, the elevation gain is only about 600 feet and you have a 360 degree view of the land. I had no idea that any of these buttes offered views like this. Sometimes it’s hard to see the forest through the trees. In fact, you can see Paulina Peak to the east and Mt. Scott, the tip of Mt. Thielsen and Diamond Peak to the south. Once I got home, I starting looking through my Oregon Atlas and Gazetteer and found that there are several buttes in the area that are easy to get to and may offer even better views. To get this shot I was using my Canon Rebel T1i along with my Canon 55-250mm telephoto lens. I also had my UV, warming filter and CIR-PL filter attached. The camera was set in Program/Normal mode and the aperture was at F-7. The ISO was at 100 and the white balance was set at -1.3 due to the bad lighting. The focal length was at 100mm and the shutter was opened for 1/250 second. Since the photo was taken at 12:52pm the lighting was pretty dull. However, I had to wait for the sun to creep around the mountains before I could get a descent shot that included some light against Mt. Bachelor. [/caption] We are enjoying the last few days of sunny and warm weather in Oregon but I can’t wait for some snow to fall in the Cascades. The farmers almanac is predicting a snowy season in the higher elevations and colder temperatures in the lower elevations. Compared to our winter last year, I’m not going to argue with that. I’m hoping for snow during Christmas and some really good snow in the mountains by this Sunday. 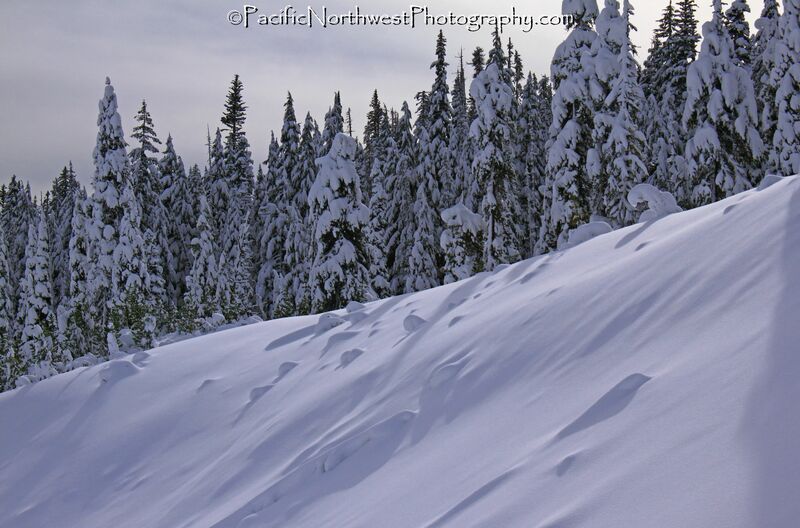 Snow-shoeing is by far the best way for me to travel to areas throughout the Cascades in order to get some really awesome photos. However, sometimes you can find some great photo opportunities in places that you would least expect. The photo in this article is a perfect example. I took this photo from the shoulder of Hwy 26, just before you get to Government Camp, OR. This spot offers some of the best views of Mt. Hood, looking from the west. Normally you find cars stopped at the shoulder putting on their chains or you may find the occasional tourist posing for pictures. I took this photo back in January 2009, after a huge blizzard. I was lucky enough to have the day off on the day the storm had broke just the morning before it snowed for 14 days straight. The mountain looks like a giant ice cream cone with no real visible bare spots. I ended up taking a 6 hour snow-shoe journey near one of the lakes that is surrounded by the presence of the mountain. Other than maybe x-country skiing, I can’t see anything better than snow-shoeing when trying to have an epic photography session after a massive snow storm. You may be able to go faster and cover more distance x-country skiing but you can go places on snow shoes that are impossible with x-country skis. I was using my 8 mp Panasonic DMC-FZ30 point and shoot digital camera. This was my first camera that I bought before purchasing my Canon T1i DSLR. I still have this camera and I’ve taken some great photos with it. I had the focal length set at 36mm and the ISO was at 80 and the white balance was at 0 step. I had the camera in landscape mode while in Program mode. The exposure time was 1/160 second and the F stop was at F-5. I don’t believe I was using my tripod but I was using my UV, warming and CIR-PL filters. I took several great shots on this day and I can only hope that this winter is half as good as the winter of 2009. I’m already dusting off my snow-shoes and going through my photos that I took during that winter.